This bar surprised me. After being completely disappointed by it's sister Cocoa Puffs Bar, I was expecting the worst. Cinnamon Toast Crunch is a classy cereal - full of life without being too sugary. And while I would never sprinkle extra sugar on the cereal, I found I enjoyed the extra sugar of the milky filling that runs through the center of each bar. It reminded me of cream-filled donut with just the right amount of filling. Rather than the creamy center being a coagulant to the whole, it came as a kind of treat in each bite. Somehow this bar had more of a meal quality than it's chocolaty brother. 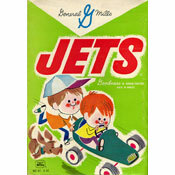 The true character of the original cereal has been maintained. There's a cinnamon crunch in each bite and this bar is a winner. What do you think of Cinnamon Toast Crunch Milk 'n Cereal Bars? Amazing but can't find in a store. I can't find these bars anywhere! I would like to know where to look! 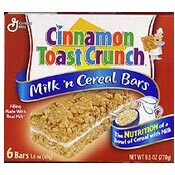 My kids love the cinnamon toast crunch breakfast bar; but, I can't find them anywhere. The first one I found at Target, but they don't have them any more. I also checked Safeway and they don't carry it either. I talked to the customer service desk and was advise they could not order any for one person's request. Please advise me where I can buy these cinnamon crunch breakfast bars. Where Can I get a case of these bars from. The Cinnamon ones are really good, haven't tried the others yet. I definitely don't like the cocoa puffs but the honey nut cheerios are tolerable. I definitely prefer the Cinnamon Toast Crunch bars. I almost didn't try it because I don't really care for the cereal. But this is a really nice blend and great for on-the-go. Here is a link to where they have it in bulk. I think these bars are great don't care much for the cheerios one or cocoa puffs one either. Anyone know where to buy these by the case I want some? These are great the best substitute for cereal! They do contain real milk and are very nutritious. The gas station is where i go 2 get what i want. I always enjoy this!!! - and I am always satisfied after I eat it!!! THANKS!!! It tastes ok for a little snack, but leaves an awful aftertaste, almost a burning feeling. The Wal-Marts in Texarkana stop selling the cinnamon toast crunch by themelves. They sell the variety pack and I don't like that. All of the "milk n' cereal" bars are good! The fake milk, which is more like cream, gives it a sweet and creamy taste, and it even had a little bit of calcium! I agree! This bar rocks! I had one today for the first time and I was like , "WOW"! I'm on the net now looking for a case of the stuff!